The mocking harassment of a Native American elder at the January 18 Indigenous Peoples March in Washington, D.C. by Catholic high school students has sparked national and international outrage. 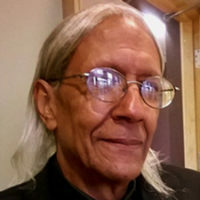 Nathan Phillips, an elder of the Omaha Nation and Marine veteran who attended the march, was accosted by a large group of white students, at least 100, from the all-boys Covington Catholic High School in Covington, Kentucky. Videos from the incident showed the teenagers shouting and chanting “Build the Wall” as Phillips continued to drum. This occurred on the steps of the Lincoln Memorial last Friday. 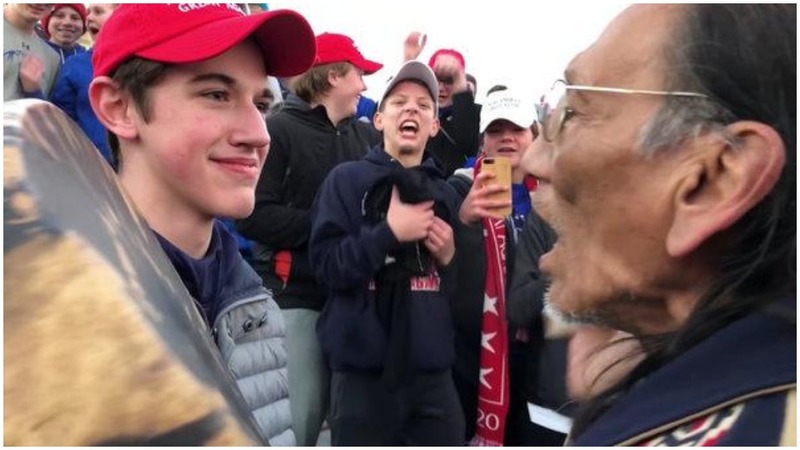 It has been confirmed that the white youth, wearing a red Trump campaign “Make America Great Again” cap, staring down the elder is Nick Sandmann, a junior at the school. According to school information, the students were in D.C. to attend the anti-abortion March for Life Rally, occurring the same day. President Trump and Vice President Pence spoke at that march. Videos online depicted Sandmann menacingly staring in the face of the lone elder as he sang and drummed. The Indigenous rally was winding up at this time; there were closing songs in the works and a round dance was being held. There are a myriad of stories emanating from this confrontation, including claims that a group known as the Black Hebrew Israelites initially insulted both Native Americans and students, that the teens were just waiting at the bus stop minding their own business, that Phillips approached the students first, that Phillips was trying to defuse a potentially dangerous situation, that the Black Hebrews were youth, that the Black Hebrews were elderly themselves, and on and on. There is a plethora of different claims and versions of the story. “There was just a few of us left at that point, chatting and lingering on the steps of the Memorial. Across the square, a large group began to form, full of young boys in red hats and red shirts. All of it emblazoned with that tired slogan many of us now wearily associate with white supremacy, racism, xenophobia, and fascism. I had never seen so much ‘MAGA’ apparel in the flesh until then. “As more of the ‘MAGA’ teens flooded the plaza behind us, our small group of remaining demonstrators moved forward, away from them. We were following Nathan Phillips, who played his drum with confidence and courage and sang a sacred prayer for peace to de-escalate the growing nervousness on the plaza. It was Nathan who’d led us in the circle dance. A tall man with a drum and a voice like his is hard to miss. And now the MAGA boys noticed Nathan, too. “From that point, things escalated quickly. We were surrounded by the boys, and we were alarmingly outnumbered. As we attempted to continue our path and move through the crowd, the boys closed in around us until, finally, one particular boy stood in front of Nathan and refused to let us pass. “Nathan stopped walking, but he kept singing and playing his drum—staring right into the smirking boy’s eyes. We all huddled around him as the other boys began to push, prod, and bump us into a tighter and tighter cluster. They were mocking Nathan’s sacred music with purposefully disrespectful dancing and a perverted imitation of his singing. Their imitations were the racist tropes of ‘Indian chants’—the stereotypical grunting and ‘hiya-hiya-hiyas’ of representations past. “As the boys molded our huddle, I felt panic growing in my gut. I felt trapped. There were so many boys that I couldn’t see beyond them. All I could see was cold faces full of empty laughter, boys intoxicated on their own false sense of power, control, and entitlement. “But Nathan was steadfast. His drumming was constant, and he exuded calm, grace, stability. He was unshaken. And it was his example that kept us all together. His singing, his drumming, his prayer. When we were surrounded by the sneering, jeering crowd, his voice was the one I latched onto. The boys alternated between their mock chanting and breaking out into familiar chants. Fortunately, this all ended peacefully, with the offending students dispersing. The video of this incident went viral worldwide. Many viewing it have placed the blame for this disgraceful episode on the school chaperones. Still, others place blame directly on Trump and Pence who spoke at the anti-abortion attended by these teen minions of right-wing politics. Recent reports are that the chaperones actually encouraged the students in their raucous responses. 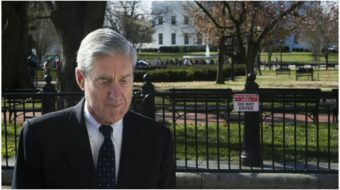 As Robin Roberts, news anchor for ABC’s Good Morning America, said in reference to the encounter, “Only people who were there know the truth.” The foregoing account from Hooligan so far seems the most credible. As for Nathan Phillips, he has been around D.C. for decades, according to those who know him well. He is described as very spiritual and humble, an organizer a lot of spiritual events, offering prayers and songs. Nathan and his wife, who passed away in 2015, lived with a mission to represent the spiritual side of life. Nathan has the reputation of always trying to bring people together. 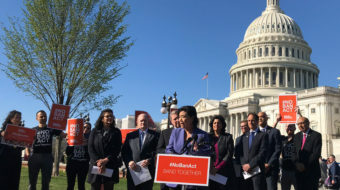 The behavior of these incendiary Catholic youth has brought condemnation from diverse sectors of U.S. society, including actors, elected representatives, celebrities and others, and even otherwise conservative news commentators. Trump, of course, weighed in on the students’ side. The racist-in-chief entered the fray with his to-be-expected position of defending racist rowdyism and bullying. He claimed that the “students were treated unfairly with early judgments proving out to be false–smeared by media.” Small wonder that he zealously supports these youthful followers who adhere to his extremist positions.